« Early, Middle and Old Age Spread! A dish to see off the winter chill. This is adapted from a recipe by Australian cookery writer Jody Vassallo and is a relatively quick all-in-one dish for small company. It took me about 50 minutes from arriving back from the market to turning off the gas under the casserole. 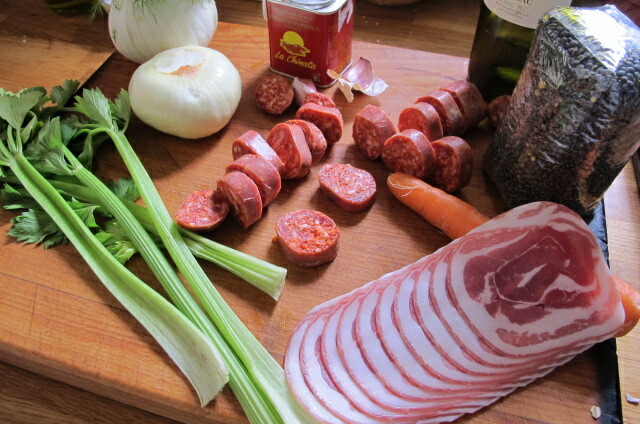 Chorizo–sausage of the moment–to be eaten in moderation of course! If made earlier in the day, you may need extra water when reheating it, as the lentils will continue to absorb the liquid–but it shouldn’t be swamped. Heat the oil in a medium casserole and fry the sausage and pancetta/ bacon until lightly coloured. Add the onion, carrot, celery and fennel and cook these in the same sausage-informed oil for about seven minutes–until they too have lightly coloured. Return the sausage and bacon to the casserole, sprinkle over the smoked paprika, add the wine, the garlic and the bay leaves. When the wine has evaporated, add the lentils and the litre of water. Bring up to the simmer, cover and cook until the lentils are tender, about 20–30 minutes. Season well and serve in warm bowls with the parsley sprinkled over and a swirl of olive oil perhaps. 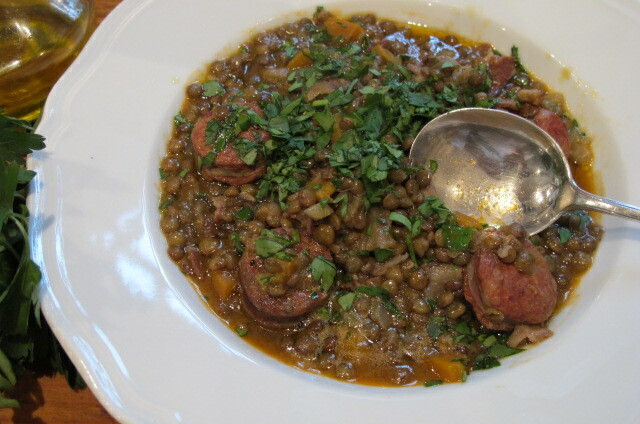 steaming bowl of lentils and chorizo! That looks fantastic. I miss being able to get a good chorizo without paying through the nose. I love that you included fennel and paprika, very tasty. If that taste half as good as it looks it had to be absolutely incredible! This looks so mouth-watering! Thank you. Thank you also for this lovely combination of words: “sausage-informed oil”. It came just as I felt I was going to scold and tell you that chorizo does render a lot of lovely perfumed oil. You sort of beat me to it and reminded me of this priceless English language dynamism and poetry. Happy cooking! PS: it looks too good to be destined to diabetics!